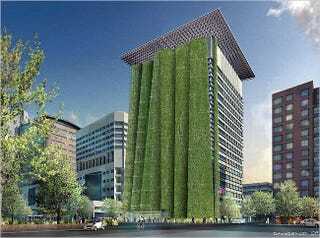 Portland, Oregon is so into the green movement that they're going to cover their federal building from ground floor to rooftop with a 200-ft. wall made from living, breathing vegetation. The living wall is more than just a pretty facade, however, as city officials claim it will lead to savings of about $280,000 per year in energy costs. Add in some solar panels (also part of the overall $133 million plan), and the building will use about 60-65% less energy than a similar-sized office. And, being a plant, the multi-fin wall is seasonal. Designers say that in the summer its foliage will provide cooling shade; in the winter months the wall will thin, providing light when the weather cooperates. One issue yet to be tackled by architects is irrigation. Rainwater from the roof is one suggestion, while water recycled from the building's plumbing is another.